When I hear the word ‘kettle’ my first thought is of the cordless, white plastic jug-style one that sits on my counter and which I boil to make tea at least seven times a day. But this week God has been speaking to me about a different kind: A huge copper kettle sitting on the edge of lamp-black coal-fired range, straight from a Victorian kitchen. This kind of kettle had an enormous capacity and was kept filled and warm on the edge of the range at all times so that it could be boiled and poured out at a moments notice. It served the needs of the whole household, providing not only tea (vital for life in Britain you know) but also hot water for cleaning, washing up and for bathing. These days you’re more likely to find one in an antiques shop, or polished up and on display somewhere. And it is lovely to look at, mostly because of what it’s made of, but there’s no mistaking that it was made for a purpose -to serve the needs of the family. Big family range-top kettles used to be made out of a variety of different metals, but in the poshest houses they were made of copper like this one. Copper was used not because of its beauty, but because it has an amazing ability to conduct heat. Not only that, but also it doesn’t corrode (rust) and has a very high melting point. The perfect metal for the job. My plastic kettle has an element inside it that heats the water, but this kettle has no capacity to heat the water by itself. Instead it relies entirely on being in close contact with the heat of the range. But we are each like this big, copper kettle. We are designed to serve the family, the body, of Christ each in our own way. Being shined-up and visible on the shelf of the household is much less important than doing the job I was made for. This is not necessarily something I find easy, but it’s true. We are like this kettle. We need to remember, to keep remembering, that we don’t have the capacity to power ourselves. I am entirely dependent on him for the power I need to do the job I was made for. And in order to receive that energy I need to be close to him. The only way for this kettle to come to the boil is to rest on the hotplate. Every single time it needs to come to the boil it has no choice but to come back into that place of rest. To be always ‘ready’, so that it stays warm all the time and can be brought to the boil quickly, it must keep coming back to resting on the hotplate regularly, and never venture very far away from it. I am like this kettle. The way I behave, the choices I make, matter. Character matters because it matters what you’re made of. Someone chose to make this kettle from copper because it was strong, able to take the weight of the water, wouldn’t corrode and fall apart, wouldn’t melt onto the stove and also because it is fantastic at conducting heat. I need to be good, not only at resting in God and absorbing ‘heat’ from him, but also at passing that heat on to others. I need to have a character that will not corrode over time, or lose strength and melt. It matters what I’m made of. 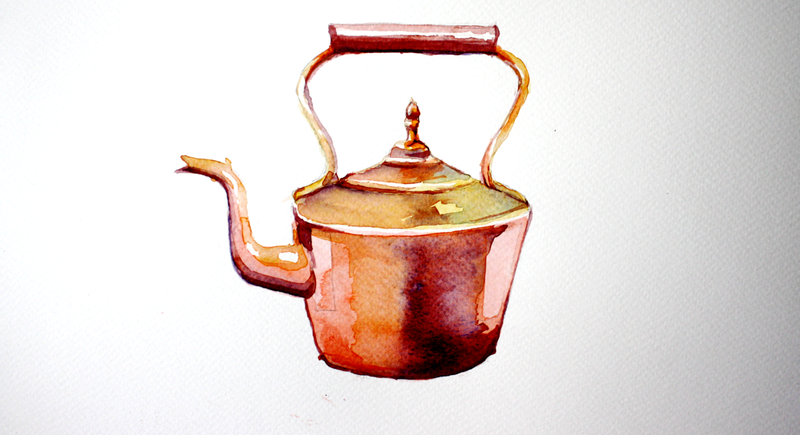 We are all like this copper kettle. We each have the capacity to serve others in a myraid of different ways. We are each important to the household in hospitality, in comfort, in keeping clean, and in sustaining. But we can do none of those things unless we stay close to the source of the heat. I’m quite partial to a long slow walk in the countryside, especially if it’s between tearooms. And I particularly love walking (very slowly) up hills. I often come to a point in the walk or climb where I’m ready to have a little sit down. I’m very British, so it’s a joy to me to sit down somewhere sheltered-ish on a fold out mat, get out a flask of tea and a sandwich and just sit for a while and look. And I think the first couple of weeks of a new year might be the perfect time to do a good bit of looking. It’s good to look back at where you’ve been. To remember that stretch where the walking was a joy and the scent of the flowers around you almost carried you along; the slope that seemed a particularly hard climb; the part where you slipped and fell into the thorns and came out limping and bleeding and yet somehow got up and carried on. If you look back at the journey of 2014 there will have been different kinds of terrain, injuries, happy times, and people who came and walked beside you in it all, it’s worth taking some time to reflect. It’s even better to sit next to Jesus and ask him to show you where he was, how he helped you, how he felt as he walked beside you on that climb. Joys and struggles, triumph and disaster. Don’t judge for yourself, ask him to show you what you did well, what you learned, how you’ve grown. And while you’re resting with Jesus at the very beginning of 2015, you might choose to have a quick look through your back pack for any rocks you might have accidentally picked up and carried with you this year. Lumps of unforgiveness especially have the ability to slow you down. It might really help to get rid of them now and not carry them through into the next year! Looking ahead is harder. The view back is always clearer than the one in front. It’s probably better not to second guess it, and if you’re like me you’ll be in the thick of January before you have time to ask too many questions. You might just ask for one word or picture that says something about what God wants you to learn or be in the next year and then, if you’re brave enough, look up into Jesus’ eyes and say “I’m not sure where I’m going, but I trust you to lead the way”. This week’s postcard is this violin. This instrument is completely beautiful, a piece of art in its own right. Craftsman made; carefully designed and created with a specific task in mind. A piece of art and a piece of engineering. Each part is doing a job and the whole is tuned and ready. And yet, until it is resting on the shoulder of the master musician, and surrendering to the tune that he chooses to play, it cannot achieve its full potential. So often we fight back, unable to trust and rest, unwilling to surrender to the tune the master wants to play with our lives. While we are wrestling we are still beautiful, still the work of a master craftsman, still treasured by him; but when we rest on his shoulder, and he turns his face to us and lifts his bow- then we become what we were always intended to be.